I know, I know… I still need to publish my post on this past SharePoint Saturday Boston… however, since SPTechCon is slightly more fresh in my mind, and, because I promised materials to one of the lucky folks who attended my sessions by the end of the day, SPTechCon has taken the driver’s seat. All I can say is what a great conference! Unfortunately, I was meeting people and companies, and talking to session-goers, catching up with friends, and meeting new ones, for the entire event, that the only sessions I was able to make it to, were my own! The panel consisted of none other than Bill English of Mindsharp, Andrew Connell of Critical Path Training, Joel Oleson of Quest, Heather Solomon of SharePoint Experts, Dux Raymond Sy of Innovative-e, and Mark Miller of EndUserSharePoint.com. (I’ll get the video posted soon enough!). My next set of thanks is going to the BASPUG attendees and speakers – thank you all so much for making yet another highly successful meeting of the BASPUG! We had over 70 in attendance, and there was barely a seat available! 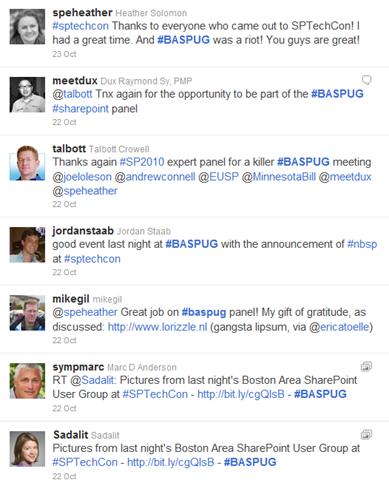 To each and every one of our speakers, you are always welcome back in Boston to the users group! 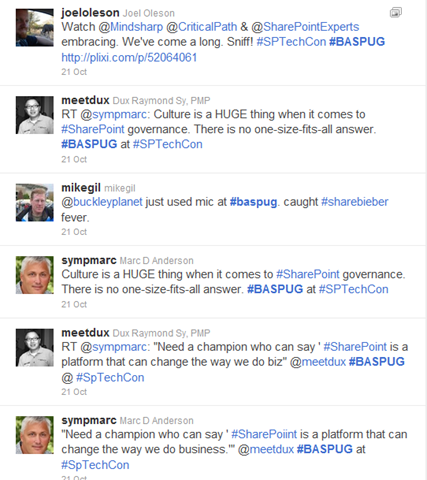 Some of the comments from the BASPUG I’d like to share.. a few images below – LOTS of talk about the #BASPUG. Thank you all! To close out the BASPUG @ SPTechCon, here is the slide deck from that night. Video, as mentioned above, still to come! 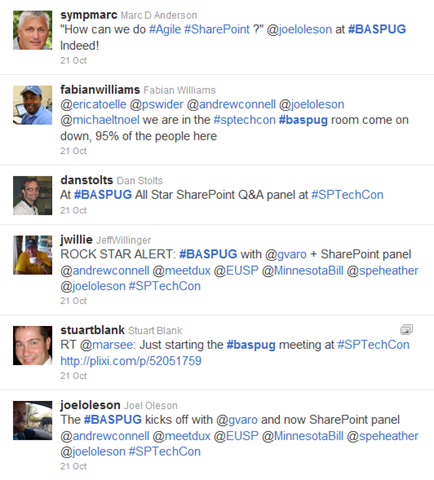 View more presentations from Boston Area SharePoint Users Group. Next, I’d like to thank all of those who attended my two sessions at SPTechCon. The first session, bright and early before Steve Fox’s keynote, was “Just Freakin’ Work! Overcoming Hurdles and Avoiding Pain” with Mark Rackley. We had almost a full room, even with the change in time, as well as for being quite early at 8:15am. Below is our slide deck from that presentation. My next session closed off the conference at 4:00 on Friday, and I delivered to a great crowd, “Creating Custom Actions in SharePoint 2010”. 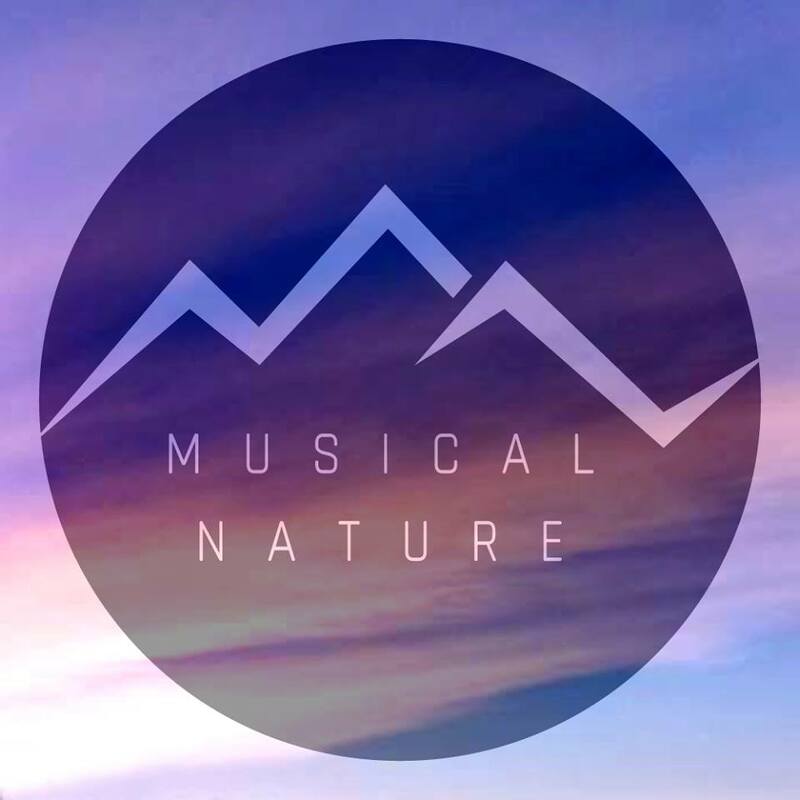 Thank you again for all who attended, and let me know if you have any questions here in the comments, so I can share them with the rest of the world, or rather, the small portion of people that view my blog 🙂 Below is my deck from that session. Thank you again everyone at the conference. I have to say, in all honesty, that this was one of the best conferences I have ever had the privilege to attend! Looking to see these sessions again? Join me in February next year at SPTechCon San Francisco!